Overview: An expose revealing the current state of farmers in America and the exploitation plaguing the fields. Screen Media Films; 2014; Not Rated; 83 minutes. A Pile of Rotten Tomatoes: Grocery stores are marketing masterminds, creating a pleasant shopping experience, an illusion of bountiful perfection. 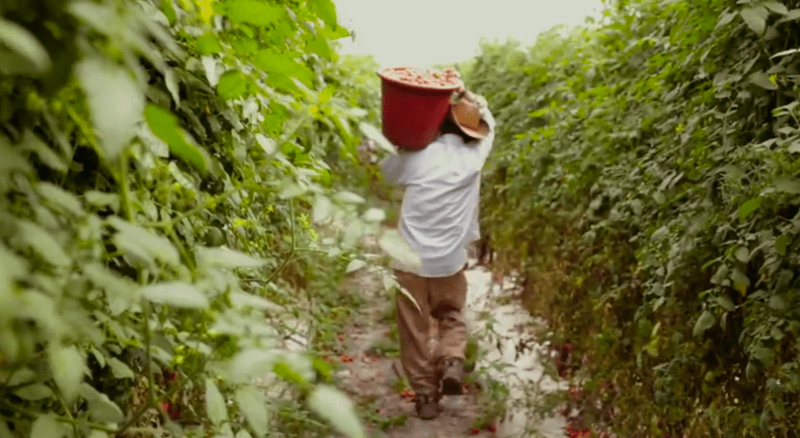 The main focus of Food Chains is the town of Immokalee, Florida–a community of tomato farmers holding protest against a local supermarket giant for a penny more per pound, for regulated working conditions, and for accountability in sexual harassment cases. Director Sanjay Rawal’s presentation is not indiscriminately targeting at a greater “evil.” Instead, he lays out the interconnected avenues of the food industry, accurately pinpointing who wields the true power to improve the industry of sustenance for all parties involved: from the farmers, suppliers, distributors, grocery stores, restaurants, and the customers. It is alarming to be awoken to the fact that grocers are willing to let crops rot in favor of a cheaper product. Rawal infuses storytelling to the highest degree with informing methods through visual stimulation. Food Chains exhibits a balance of historical information spanning from the earlier cases of farming exploitation to the progression (or lack of progression) to today’s farmlands without drowning viewers in statistical data. Nor does Rawal over-stress emotional invocation by relying too heavily on personal accounts. He is objective in allowing the viewer to digest the information and draw their own conclusions; for a person will only see what they are willing to see. Rich get Richer, Poor get Poorer: The release of Food Chains is almost serendipitous, running concurrently with the wave of movies from the Divergent and The Hunger Games series. In both, the presence of economic inequality is obviously present. The film is an in-depth narrative on the farming factions and districts, if you will, and a necessary uprising that develops. The agricultural backbone is delicate, resting on the shoulders of the voiceless, migrant farmers from Mexico, often too hesitant to argue in fear of deportation. As it currently stands, the agriculture framework is designed to inhibit growth in not only economic disunity, but basic human necessities. Rawal’s film does not directly out the wealthy and privileged, however, I have no reservations in calling out the ignorant and inhumane. The people who are willing to work laborious hours in the fields are in no way “the help.” They are specialists; completing the work others cannot do. The executive of any supermarket who does not already participate in the Fair Food Program, is inept compared to the hands rearing and harvesting produce. The delay in a reformed agricultural system where everyone can win brought by the higher ranks of the food supply chain. Hunger will never be an issue for the rich…unless we make it an issue. Final Thoughts: Food Chain is inquisitive and explorative, imploring viewers to break the chains binding the food industry because… why starve the hands that feed you? Teaira currently resides in the Pacific Northwest, an office cube dweller by day, a foodie, independent bookstore seeker, horror scaredy cat at all other times. She is a sucker for stars and is fond of getting lost in the city.